Dermatologists consider lasers to be the most effective and reliable method of tattoo removal available as they are safe and provide consistently good results on multi-coloured tattoos. The laser is directed onto the tattoo where the high frequency light breaks down the ink pigment into smaller particles which are disposed of via your immune system. Treatments last between 10 and 30 minutes and we recommend a course of 1 to 15 treatments at intervals of 6 to 8 weeks depending on the size, intricacies and colours of the tattoo. 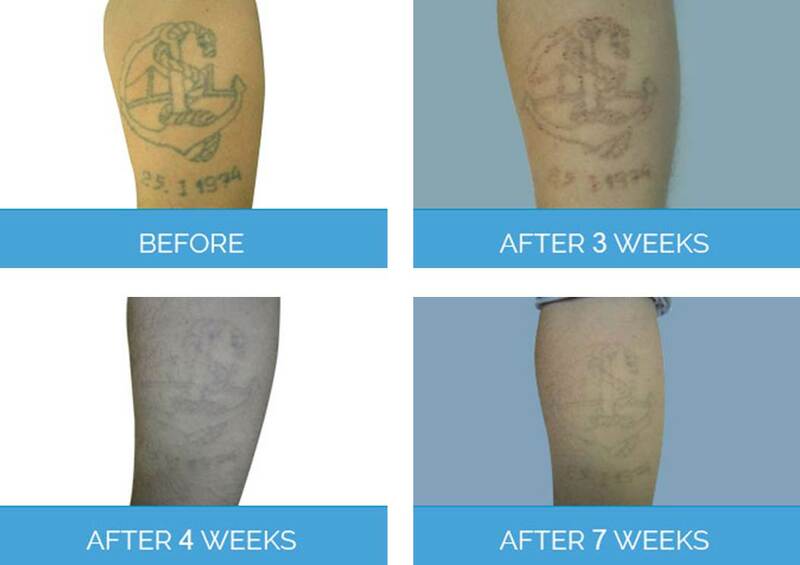 After each treatment, the tattoo will gradually fade away over the following weeks. Immediately after treatment, the skin will go white, this is completely normal and will fade relatively quickly. Swelling and soreness may be experienced for 48 hours. Some tattoos may form a graze after treatment which should be left to heal naturally, picking or removing the scab will result in scarring. Sometimes, small blisters may form at the treatment site, but this will heal in a short time. Following laser treatment, some skin discoloration may be noticed and the skin may not tan in the same way as non-treated skin. However, these should both stabilize over time. Depending on the size of you tattoo, each session takes between 10 and 40 minutes. Laser tattoo removal gives permanent results. This is very dependent on the condition of your skin, size and colours used in the tattoo. Most clients find that between 5-12 sessions are sufficient. No, laser tattoo removal will not scar you. Yes, all tattoo colours can be removed. Black, blue and red tattoos are the easiest to remove. White, yellow, pink and purple are more difficult to remove. Green tattoos can be very difficult to remove and may require extra sessions. Yes, there are alternative acne treatments, however laser is a proven technique to minimize the severity and frequency of outbreaks. There are no patient stories for Laser Tattoo Removal.